Nepeta satureioides Boiss. has been used in traditional medicine of eastern countries and is famous for its medicinal properties. The aim of this study was to evaluate the effect of methanol (MeOH), n-hexane and dichloromethane (CH2Cl2) fractions of the extract on melanin synthesis and oxidative stress in B16F10 melanoma cell line. The B16F10 cell line viability after treatment with increasing concentrations of different fractions of the plant (5-60 μg/mL) was measured using MTT assay. The inhibitory effect on synthesis of melanin, mushroom tyrosinase activity, cellular tyrosinase and oxidative stress were determined by the colorimetric and fluorometric methods. The data showed that at concentrations below 60 μg/mL, fractions did not show significant toxicity on melanoma cells. The amount of melanin synthesis by MeOH and CH2Cl2 fractions and mushroom tyrosinase activity by the MeOH fraction declined in B16F10 cells. In addition to the capacity of MeOH, n- hexane and CH2Cl2 fractions in decreasing the amount of reactive oxygen species (ROS) in melanoma cells, all fractions revealed remarkable antioxidant activity. The melanogenesis inhibitory and antioxidant effects of N. satureioides on B16F10 cells may suggest this plant as a new pharmaceutical agent in reducing skin pigment and skin aging in cosmetic industry. Natural products with melanin synthesis inhibitory activity have received much attention because they are associated with hyperpigmentation disorders in humans such as lentigo, nevus, ephelis, post-inflammatory state and melasma mask of pregnancy. Increased number of melanocytes or activity of melanogenic enzymes causes hyperpigmentation . Melanin is a group of natural pigment produced by the oxidation of the amino acid tyrosine. Although melanin is involved in many processes such as thermoregulation, cation chelation and antibiotic activity but photoprotection and absorbing of ultra violet radiation (UVR) are known as the main function of melanin. Therefore, melanin is responsible for protection of skin cells from UVR damage. Tyrosinase is one of the main enzymes in the regulation of the first two steps of melanin synthesis pathway and catalyzes the oxidation of L-tyrosine to 3,4-dihydroxyphenyl-L-alanine (L-DOPA) which is then oxidized to dopaquinone and finally produces melanin . Plant extracts with the tyrosinase inhibitory activity reduced melanogenesis and used in pharmaceutical and cosmetic industries . It has been reported that hydrogen peroxide (H2O2) and other reactive oxygen species (ROS) are produced in the melanogenesis process by UV irradiation. ROS is involved in the regulation of melanin synthesis and UV-induced melanogenesis could be repressed with inhibition of ROS generation . Also it is well known that exposure to UV radiation increases the ROS production that is involved in the pathogenesis of several skin conditions including aging, wrinkles, photo-sensitivity and malignancy . The B16F10 murine melanoma cell line is considered as a good model for studying human melanoma . Nepeta (Lamiaceae) contains about 250 perennial species found mostly in Europe and Asia as well as North Africa . There are 79 species of this genus found in Iran of which 38 species are endemic to the country . Nepeta satureioides Boiss. is an annual herb, which is grown in Central Asia, Afghanistan, Pakistan and Iran . The genus Nepeta from Lamiaceae, consist of 79 herbaceous perennial and rarely annual species growing in Iran. Thirty eight of these species are endemic to the country. N. satureioides Boiss. is one of the aromatic plants. This medicinal plant is traditionally used for common cold, sinusitis and as a carminiative. Infusion provided from the aerial parts of N. satureioidesis are used in folk medicine as a carminative and for cure of colds and bronchitis ,,. However, there are no scientific reports on melanogenesis inhibitory activity of N. satureioides. Thus, the aim of this study was to investigate the inhibitory effect of methanol (MeOH), n-hexane and dichloromethane (CH2Cl2) fractions of N. satureioides on melanogenesis and to evaluate the potential antioxidant characteristics of the plant on B16F10 melanoma cells. N. satureioides was collected in June 2013 from Gonabad altitude of Razavi Khorasan province located in the northeast of Iran. A voucher specimen of the plant with ID 11259 was deposited in the herbarium of School of Pharmacy, Mashhad University of Medical Sciences, Mashhad, Iran. Aerial parts of N. satureioides (100 g) were grounded by a blender (Toos shekan Co, Iran) and then perculated with MeOH at room temperature for 24 h according to previously reported protocol . After extraction, the solvent was evaporated using a rotary evaporator and then freeze dried. The freeze dried extract (10 g) was then subjected to subsequent fractionation with solvent of increasing polarity including n-hexane, CH2Cl2, ethylacetate, n-butanol and water. B16F10 melanoma cell line (Cat. No C540) was purchased from the Pasteur Institute of Iran (Tehran, Iran) and maintained at 37 °C in a humidified atmosphere (90%) containing 5% CO2. Cells were cultured in RPMI-1640 (Bioidea, Iran) with 10% (v/v) fetal bovine serum, 100 U/mL penicillin, and 100 μg/mL streptomycin. In order to evaluate the cytotoxic effect of different fractions of N. satureioides on cells, 3-(4, 5-dimethylthiazol-2-yl)-2, 5-diphenyltetrazolium bromide (MTT) cytotoxic assay was performed . To monitor cell viabilities, cells (2 × 104 cells per well) seeded in a 96-well plate overnight. The cells then exposed to different concentrations of fractions (5 - 60 μg/mL) for 24 h.
B16F10 cells were cultured in a 12-well plate overnight and then were treated with different concentrations (5-40 μg/mL) of MeOH, n- hexane and CH2Cl2 fractions of N. satureioides. After 24 h, the cells were detached by trypsin and then were washed with PBS. The cell pellets were solubilized in 100 μL solution of sodium hydroxide (2 M) for 30 min at 100 °C. Melanin content was compared with that of the control by their absorptions at 405 nm . where, A is the mean absorption values measured for the different fraction concentrations and B is the average absorption values in the control group. The tyrosinase activity in B16F10 cells was determined by measuring the rate of oxidation of L-3,4-dihydroxyphenylalanine (L-DOPA) . In summary, 2×104 B16F10 cells were plated in a 24-well plate. The cells were then incubated with MeOH, n- hexane and CH2Cl2 fractions of the plant at 5-40 μg/mL for 24 h.
Then cells were washed with PBS and were lysed in PBS containing 1% Triton X-100 and mixed with 2 mL of L-DOPA (2 mg/mL) for 20 min. After incubation for 2 h at 37°C then the absorbance was read at 475 nm using a micro-plate reader (BioTek, USA). B16F10 melanoma cells (104 × 2) were seeded in 96-well plates overnight and then were treated with different concentrations of MeOH, n- hexane and CH2Cl2 of plants at 5-40 μg/mL for 24 h. Then cells incubated with 50 μL H2O2 (24 mM) at 37 °C for 30 min. Then 50 μL of dichloro-dihydro-fluorescein diacetate (DCFH-DA) were added to the cells and the fluorescence intensity of dichloro-fluorescein (DCF) was measured at 528 nm emission and 485 nm excitation using a Synergy H4 microplate reader (BioTek, USA). All experiments were repeated in triplicate and the relative results were presented as the mean ± SD of the three independent measurements. Analysis of variance was performed using one-way ANOVA test with GraphPad Prism 5.0 and the means were compared by Dunnett tests. P < 0.05 stands for statistically significant difference between extract-treated cells and control. In this study, MTT assay was performed in order to monitor cell viability. B16F10 cell lines were seeded in a 96-well plate. After 24 h cells were treated with different concentrations of MeOH, n- hexane and CH2Cl2 fractions of N. satureioides. As illustrated in [Figure 1], results showed that treatment of the cells with concentration of 60 μg/mL of MeOH, n- hexane and CH2Cl2 fractions significantly reduced their cell viability (P < 0.05) and induced the cell death (P ≤ 0.05). Figure 1: Effect of different concentrations of MeOH, n-hexane and CH2Cl2 fractions of N. satureioides on cell viability *(P < 0.05). To determine the antimelanogenic activity, the inhibitory effect of different fractions of MeOH, n- hexane and CH2Cl2 of N. satureioides were assessed on melanin content of B16F10 cells. Kojic acid (2 mM) was utilized as a positive standard. The results showed that the concentration of 15, 20 and 40 μg/mL of MeOH and 20 and 40 μg/mL of CH2Cl2 fractions had inhibitory effect on melanin synthesis [Figure 2]. Figure 2: Effect of different extracts of N. satureioides on melanin content in B16F10 murine melanoma cells *P < 0.05 as compared to control. The tyrosinase enzyme inhibition experiment using L-DOPA as substrate and mushroom tyrosinase as enzyme source was performed to assess the inhibitory effect of N. satureioides on mushroom tyrosinase activity. The results indicated that mushroom tyrosinase activity was inhibited only by the concentration of 20 μg/mL of MeOH fraction. Kojic acid (2 mM) was used as positive control [Figure 3]. 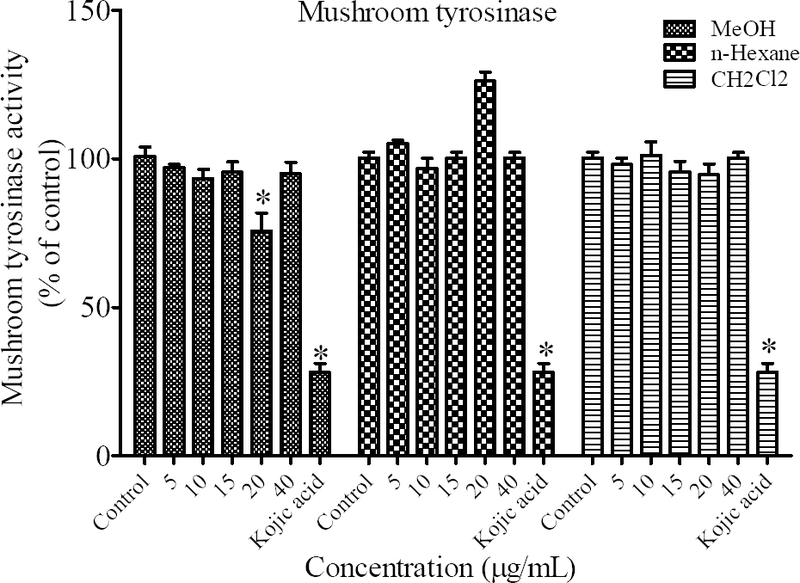 Figure 3: Effect of different extracts of N. satureioides on mushroom tyrosinase activity in B16F10 murine cells. *P < 0.05 as compared to control. To evaluate the mechanism of the inhibitory effect of N. satureioides extract on melanogenesis in particular, we determined intracellular tyrosinase activity in B16F10 melanoma cells. The results indicated that all fractions of N. satureioides at 20 μg/mL and n-hexane and CH2Cl2 fractions at 40 μg/mL could significantly inhibit cellular tyrosinase activity [Figure 4]. Figure 4: Effect of different extracts of N. satureioides on cellular tyrosinase activity in B16F10 murine melanoma cells. *P < 0.05 compared to control. The intracellular ROS levels as an indicative of antioxidant capacity of N. satureioides was measured in cells treated with 24 mM H2O2 alone or with MeOH, n-hexane and CH2Cl2 fractions in B16F10 melanoma cells. As shown in [Figure 5] cells pretreated with plant extracts could significantly suppress the oxidative stress induced by H2O2 [Figure 5]. 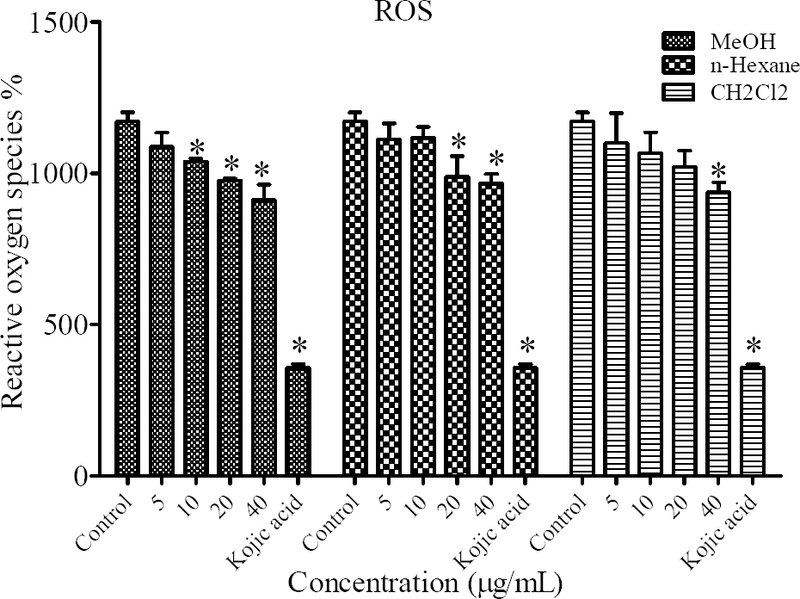 Figure 5: Antioxidant effects of different extracts of N. satureioides on cellular reactive oxygen species (ROS) levels in B16F10 murine melanoma cells. *P < 0.05 compared to control. Chemicals and natural base preparations have been widely used for the prevention of skin hyper pigmentation disorders. Inhibition of the melanin formation, inhibition of the tyrosinase activity, scavenging of free radicals and preventing the translocation of melanosomes from melanocytes in to epidermal cells are pathways mainly affected by agents used in the treatment of hyperpigmentation . In the current study, to identify the appropriate concentration of the plant fractions which do not affect the viability of B16F10 melanoma cells, the MTT assay was performed with N. satureioides different fractions. The MTT assay is a common colorimetric assay to determine the dead cells from living cells. Different concentrations (5-60 μg/mL) of MeOH, n-hexane and CH2Cl2 fractions for 24 h showed, at concentration equal or higher than 60 μg/mL all fractions were significantly cytotoxic. Consequently, we have chosen concentration below 60 μg/mL to determine the inhibitory effect of N. satureioides on melanogenesis. The results indicated that MeOH fraction could significantly inhibit the mushroom tyrosinase activity at 20 μg/mL. 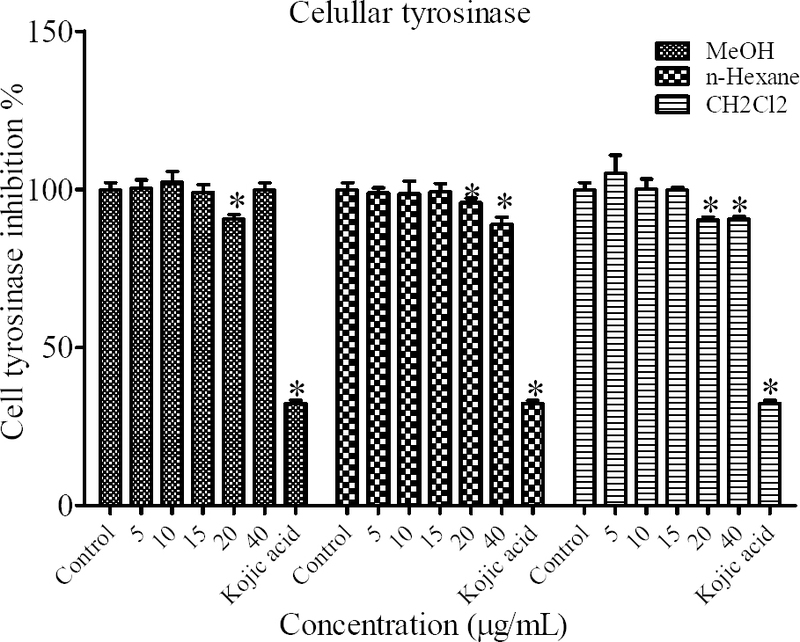 In order to distinguish if inhibition in the mushroom tyrosinase activity is resulted from the inhibition of endogenous tyrosinase activity, the inhibition in intracellular tyrosinase activity by N. satureioides was measured. Although n-hexane and CH2Cl2 fractions did not show significant effect on mushroom tyrosinase activity but all fractions were able to reduce the cellular tyrosianse activity which was in accordance with the decrease in melanin production in the cells for MeOH and CH2Cl2 fractions. In order to evaluate the antioxidant properties of this plant extract, intracellular ROS levels was measured. DCFH-DA was used as indicator for ROS measurement. DCFH-DA is hydrolyzed by the endogenous esterases to dichloro-dihydro-fluorescein (DCFH) and then DCFH reacts with ROS such as H2O2 to produce DCF. The fluorescent intensity of DCF as a product of oxidation of DCFH by intracellular radicals is compared in samples . Our results indicated all fractions of N. satureioides were able to reduce the free radical levels in a dose dependent manner. Main component of Nepeta species are nepetalactones, iridoids and their glucosides, diterpenes, triterpenes and flavonoids which are responsible for biological activities such as antibacterial, antifungal and antiviral . This is the first attempt to evaluate the inhibitory effect of N. satureioides on melanogenesis in B16F10 melanoma cells. The results of the present study confirmed the inhibitory effect of N. satureioides on melanogenesis process may facilitate through antioxidant capacity of the plant. In accordance to our results some other studies have been reported the combination effect of antioxidant and antimelanogenic for chestnut flower extract , and Magnolia grandiflora L.  as shown for N. satureioides. The MeOH and CH2Cl2 fractions have decreased cellular tyrosinase activity, melanin content and ROS. Semipolar nature of MeOH and CH2Cl2 may extract phytochemicals which are responsible for antimelanogenic activity. Although the n-hexane fraction could decrease ROS and cell tyrosinase activity but it could not show any inhibitory effect on melanin content which may indicate that plant phytochemicals with nonpolar nature have not significant effect on the melanogenesis process ,. There are many reports about plants to have the inhibitory effect on melanin synthesis and tyrosinase which may have a high potential for the treatment of skin disorder. For example Phetdee, et al. showed tamarind seed coat extract can reduce melanin production by 20-32% . In another research ethanol leaf extracts (500 μg/mL) of Aloe ferox Mill, A. aculeata Pole-Evans, A. pretoriensis Pole-Evans, and A. sessiliflora Pole-Evans exhibited 60%, 31%, 17%, and 13% inhibition of tyrosinase activity respectively. Also bark extract of Harpephyllum caffrum Bernh. (500 μg/mL) showed good inhibitory effect on tyrosinase and melanin production so it has the potential to be used as the source of chemical ingredients for antpigmentation therapy . The potential inhibitory effect of Magnolia grandiflora L. flower extract, Paeonia suffruticosa Andrews, chestnut flower extract and leaf extracts from wild bitter melon on melanogenesis also have been reported ,. Some compounds isolated from methanolic extract of the flower buds of Cananga odorata showed the inhibitory effect on melanogenesis which may be effective in skin diseases . Based on our results N. satureioides with dual actions of antioxidant and antimelanogenic activities may contribute in skin whitening and could be included in cosmetic formulations of skin care products. In this study, MeOH and CH2Cl2 fractions of N. satureioides showed potential effects against melanin production in B16F10 melanoma cells. 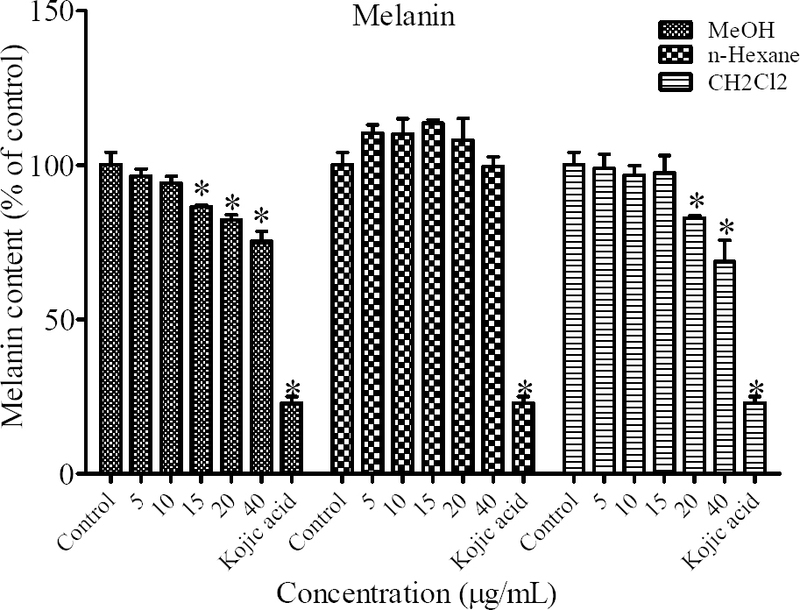 This is the first report about the effect of N. satureioides on melanin production. It is found that N. satureioides also expressed antioxidant activities. The results suggested that the ability of N. satureioides to decrease melanin production may be attributed to its inhibitory action upon the signaling pathway regulating tyrosinase activity or depletion of cellular ROS. Financial support of this study was provided by Mashhad University of Medical Sciences. This work was a part of Pharm.D thesis No. 910875. Griffiths C, Finkel L, Ditre C, Hamilton T, Ellis C, Voorhees J. Topical tretinoin (retinoic acid) improves melasma. A vehicle?controlled, clinical trial. Br J Dermatol. 1993;129(4):415-421. Seo S-Y, Sharma VK, Sharma N. Mushroom tyrosinase: recent prospects. J Agric Food Chem. 2003;51(10):2837-2853. Yamakoshi J, Otsuka F, Sano A, Tokutake S, Saito M, Kikuchi M, et al. Lightening effect on ultraviolet-induced pigmentation of guinea pig skin by oral administration of a proanthocyanidin-rich extract from grape seeds. Pigment Cell Res. 2003;16(6):629-638. Masaki H. Role of antioxidants in the skin: anti-aging effects. J Dermatol Sci. 2010;58(2):85-90. Overwijk WW, Restifo NP. B16 as a mouse model for human melanoma. Curr Protoc Immunol. 2001: Chapter 20: Unit 20.1. Mabberley DJ. Mabberley’s plant-book. Cambridge University Press. 2008. P. 581. Jamzad Z. Lamiaceae in Flora of Iran. Research Institute of Forests & Rangelands, Tehran. 2012;76. P. 488 (in Persian). Emami S, Aghazari F, Johartchi M. Les Phanerogames endemiques de la flore d’Iran: L’Université de Téhéran des Sciences Médicales, Institut des Études d’Histoire de la Médecine, de Médecine Islamique et de Médecine Complémentaire; 2011. pp. 383-391. Asgarpanah J, Sarabian S, Ziarati P. Essential oil of Nepeta genus (Lamiaceae) from Iran: a review. J Essen Oil Res. 2014;26(1):1-12. Tundis R, Nadjafi F, Menichini F. Angiotensin?Converting enzyme inhibitory activity and antioxidant properties of Nepeta crassifolia Boiss & Buhse and Nepeta binaludensis Jamzad. Phytother Res. 2013;27(4):572-580. Tayarani-Najaran Z, Hajian Z, Mojarrab M, Emami SA. 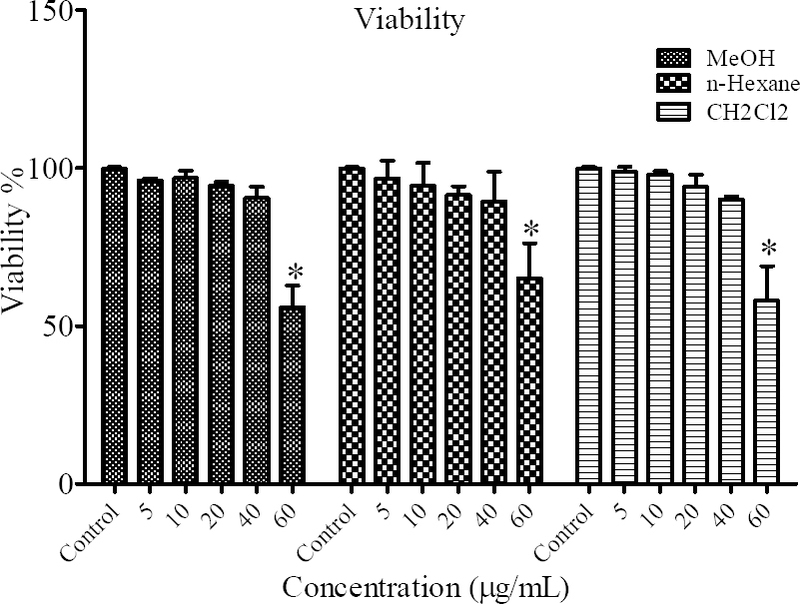 Cytotoxic and apoptotic effects of extracts of Artemisia ciniformis Krasch. and Popov ex Poljakov on K562 and HL-60 cell lines. Asian Pacific Journal Of Cancer Prevention: APJCP. 2013;15(17): 7055-7059. Tayarani-Najaran Z, Mousavi SH, Tajfard F, Asili J, Soltani S, Hatamipour M, et al. Cytotoxic and apoptogenic properties of three isolated diterpenoids from Salvia chorassanica through bioassay-guided fractionation. Food Chem Toxicol. 2013;57:346-351. Tada H, Shiho O, Kuroshima K-i, Koyama M, Tsukamoto K. An improved colorimetric assay for interleukin 2. J Immunol Methods. 1986;93(2):157-165. Kamagaju L, Morandini R, Bizuru E, Nyetera P, Nduwayezu JB, Stévigny C, et al. Tyrosinase modulation by five Rwandese herbal medicines traditionally used for skin treatment. J Ethnopharmacol. 2013;146(3):824-834. Hyun SK, Lee W-H, Jeong DM, Kim Y, Choi JS. Inhibitory effects of kurarinol, kuraridinol, and trifolirhizin from Sophora flavescens on tyrosinase and melanin synthesis. Biol Pharm Bull. 2008;31(1):154-158. Yokozawa T, Kim YJ. Piceatannol inhibits melanogenesis by its antioxidative actions. Biol Pharm Bull. 2007;30(11):2007-2011. Huang H-C, Hsieh W-Y, Niu Y-L, Chang T-M. Inhibitory effects of adlay extract on melanin production and cellular oxygen stress in B16F10 melanoma cells. Int J Mol Sci. 2014;15(9):16665-16679. Galato D, Ckless K, Susin MF, Giacomelli C, Ribeiro-do-Valle RM, Spinelli A. Antioxidant capacity of phenolic and related compounds: correlation among electrochemical, visible spectroscopy methods and structure–antioxidant activity. Redox Report. 2001;6(4):243-250. Sapkota K, Park S-E, Kim J-E, Kim S, Choi H-S, Chun H-S, et al. Antioxidant and antimelanogenic properties of chestnut flower extract. Biosci, Biotech, Biochem. 2010;74(8):1527-1533. Huang H-C, Hsieh W-Y, Niu Y-L, Chang T-M. Inhibition of melanogenesis and antioxidant properties of Magnolia grandiflora L. flower extract. BMC Complement Alter Med. 2012;12(1):72-80. Phetdee K, Rattanamanee K, Teaktong T, Viyoch J. Tamarind seed coat extract reduces melanin production via tyrosinase in melanocyte. J Biol Sci. 2012;12(4):239-245. Mapunya MB, Nikolova RV, Lall N. Melanogenesis and antityrosinase activity of selected South African plants. J Evid Based Complementary Altern Med. 2012;2012. Article ID 374017. Tsai T-H, Huang C-J, Wu W-H, Huang W-C, Chyuan J-H, Tsai P-J. Antioxidant, cell-protective, and anti-melanogenic activities of leaf extracts from wild bitter melon (Momordica charantia Linn. var. abbreviata Ser.) cultivars. Botanical Studies. 2014;55(1):1-7. Tan LTH, Lee LH, Yin WF, Chan CK, Abdul Kadir H, Chan KG, et al. Traditional uses, phytochemistry, and bioactivities of Cananga odorata (Ylang-Ylang). J Evid Based Complementary Altern Med. 2015;2015. Article ID 896314.